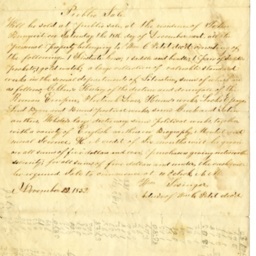 Document announcing public sale for the personal property of William C. Pettit, deceased. Pettit was a teacher who had taught for a period in Hardy County and then in Shenandoah County where he died sometime in the early 1850s. 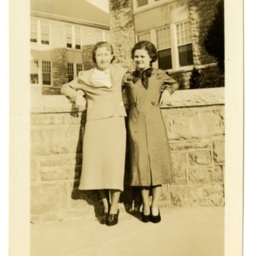 Photograph of Josephine Miller (Lynn) and Marie Boyer at Harrisonburg State Teacher's College sometime around 1930. Both graduated and became teachers in Shenandoah County. 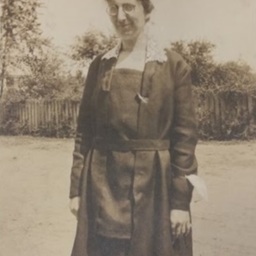 Photograph showing Frances Jenkins (1884-1980), teacher at Strasburg High School. The picture was taken sometime around 1920, It appears in Pauline Lichliter's high school scrapbook. Principal and Faculty. 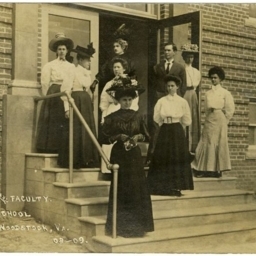 New High School, Woodstock, Va.
Postcard with a picture of the principal and faculty at the former Woodstock High School on Court Street.